Sony RX0 Announced, Price $698, Waterproof and Robust Design ! Sony has officially announced DSC-RX0 (B&H Photo) waterproof and Robust design compact camera. It’s equipped with a 1-inch, 15.3-megapixel Exmor RS CMOS sensor and a fixed Zeiss 24mm F4 wide-angle lens, giving it the same kind of high image quality you’d see with a new RX100 Mark V, for instance. It can also shoot 4K video, full HD at 240 fps and 16 fps RAW still images. The release date for Sony RX0 will be in October, 2017. 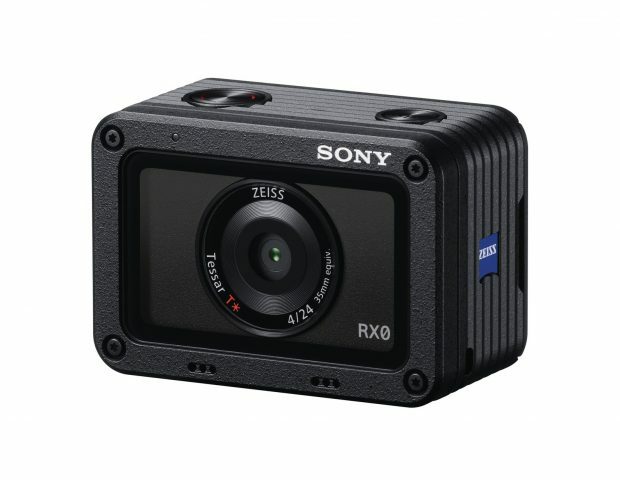 Get instantly notified by e-mail when Sony RX0 is Available for Pre-order ! Designed to facilitate creative expression beyond current limitations, RX0 is equally adept at shooting still images or filming video on its own, as well as when included as part of a multi-camera set-up to maximize creativity. Its miniature dimensions and all-around versatility allow creators to approach unique photographic and videographic challenges in new ways, always with the assurance of high quality results. Weighing just 3.9 oz10 and measuring approximately 2.38 in. x 1.63 in x 1.19 (WxDxH)11, the RX0 redefines how small and light a premium compact camera can be. The new model can be used as a standalone camera or as part of a multi-camera rig in any kind of shooting conditions including rain, underwater, space-limited, sandy or dusty environments and more. Multiple RX0s can be linked together in a variety of ways to film and produce unique content like bullet-time, time-slice and many other unique styles of content creation. Sony’s wireless radio commander, the FA-WRC1M can be used to trigger up to fifteen12 RX0’s simultaneously, while Sony’s PlayMemories™ Mobile13 app allows up to five RX0 models to be connected and controlled wirelessly from any paired device. A wireless multi-camera shooting solution capable of connecting additional RX0 units when an access point is used14 is currently under development with a target release date of January 2018 via firmware update. For users looking for a more reliable wired connection, a camera control box is being developed and will also be released in January 2018. The new RX0 camera features a 1.0-type stacked 15.3 MP6 Exmor RS CMOS image sensor, BIONZ X™ processor and a wide-angle ZEISS® Tessar T* 24mm F4 fixed lens to deliver high resolution and less distortion results for both RAW and JPEG stills and across all supported video formats. It is equipped with an Anti-Distortion Shutter that can shoot as fast as 1/32000 second, as well maximum burst shooting capability at up to 16 fps, ensuring that even fast moving objects are beautifully and accurately rendered. Its small size also makes it an ideal choice for casual shooting, street and travel photography and more. The new portable RX0 is waterproof1,2 at depths of up to 10 meters (33 ft) on its own, and can be used at up to 100m15(330 ft) depth when paired with the new MPK-HSR1 Housing. The camera is shockproof3,1 when dropped from up to 2 meters (6.5 ft) and crushproof4,1 to 200kg / 440lb / 2000N, making it durable enough to withstand tough shooting conditions including rain, sand, dust, snow and more, where traditional cameras simply cannot operate. On the video front, the RX0 is packed with a variety of creative and powerful features including super slow motion capture8 at up to 960 frames per second, 4K clean HDMI output to an external recorder as well as MF assist and Peaking to adjust focus to exact preferences of the creator, as well as Preset Focus options which enhance control. The camera also offers Picture Profile options and S-Log2, as well Time Code / User Bit features, which are extremely useful for multi-camera shoots. To maximize the potential of RX0, a host of new accessories are available that support new and different ways of shooting. These include the VCT-CGR1 Cage for increased system flexibility, the MPK-HSR1 Housing, enabling the RX0 to be taken down to depths of up to 100 meters underwater15, the CPT-R1 Cable Protector, VF-SPR1 Spare Lens Protector, VFA-305R1 Filter Adaptor Kit which includes filter adaptor, lens hood and MC protector, plus the NP-BJ1 Rechargeable Battery Pack and ACC-TRDCJ Accessory Kit. The new compact RX0 camera will ship in October 2017, priced at approximately $700 US / $900 CA. Previous Previous post: Sony RX1R III w/ 4K Video to be Announced Today ?